Your coins are now more valuable when melted down than they are at face value. The Associated Press has recently reported that the metal used to create a nickel costs the U.S. Mint 6.99 cents and the metal inside a penny costs the Mint 1.12 cents. 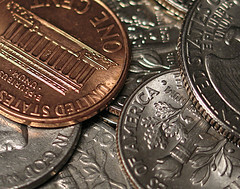 After production costs, the Mint spends a total of 8.34 cents for each nickel it produces and 1.73 cents for each penny. U.S. Mint officials said Wednesday they were putting into place rules prohibiting the melting down of 1-cent and 5-cent coins. The rules also limit the number of coins that can be shipped out of the country. “We are taking this action because the nation needs its coinage for commerce. We don’t want to see our pennies and nickels melted down so a few individuals can take advantage of the American taxpayer,” Mint Director Edmund Moy said in a statement. “Our” pennies and nickels? Shouldn’t the money that I earn by mine? The money isn’t on loan to me from the government. It’s mine. I should be able to turn it into art or make a coin ring, should I choose to do so. But the government, for whatever reason, thinks that the money really is theirs. If I design a website for a client and hand it off to them upon completion, I don’t tell them what they can and can’t do with it. It’s theirs. Transferral of ownership dictates that they’re free to do with it as they please. Don’t I have similar ownership over the currency I’ve obtained through my labor? The new regulations prohibit the melting of 1-cent and 5-cent coins, with a penalty of up to five years in prison and a fine of up to $10,000 for people convicted of violating the rule. This reminds me of when FDR confiscated private gold from U.S. citizens. Why the government thinks they have a right to do this is beyond me. The actions reek of hypocrisy and shifting blame. First, the government inflates the supply of money circulating in our economy which causes the price of metal to rise above the face value of the coins. Then to prevent potential consequences of their own actions, they threaten imprisonment and a fine for anybody who dares melt their own coins. The new regulations are being published in the Federal Register and will go into effect as interim rules which will not become final until the government has a chance to consider possible modifications based on public comments. I have a proposal for a “possible modification” of the Mint’s new “regulations”. It is this: Don’t presume to tell me what I can do with my private property. ← Do You Really Want the Rest of the Book of Mormon? Haven’t there always been laws against taking money out of circulation? Back when we were backed by a gold or silver standard, where the coins actually represented some fraction of a bar of gold at Fort Knox or wherever, I could see the government saying that the coins were theirs, as in the coins were just a representation of the gold that was in store, and to keep the amount of gold and the representative cash in line, they’d make laws to protect it. Money (as we have it today) is the physical representation of the abstract concept of value–be it labor or merchandise. In order for so many of us to work together, as in a nationwide economy, sure that whole system needs to be uniformly regulated. The cash itself is meaningless as private property; its true value is the abstraction represented by it, and in order to preserve that ‘true value’ we all have to play along with the system. The following quote, surrounded by advertisements, faced me when I tried to follow the article. Connor, please find a copy of the article that your readers can still get to after two weeks. I was catching up on your blog, which I usually enjoy, and I ran into this problem. The text of the article can be found here. Connor, I recommend a book for you to read called, “The creature from Jekyll Island,” by G. Edward Griffin. It’s a must read if you want to know the true nature of our monetary system. The power to issue our currency was given to a private banking system called the “Federal Reserve” in 1913 through passage of the 16th amendment. The name gives the impression that it’s a government entity which is totally false. The real reason why things cost more today than they did 50 years ago is because the value of the dollar has been dropping due to the circulation of ever more quantities of dollars. It’s a hidden tax, and there lies the great scam of it all. Of course in school we’re only taught that inflation is due to a rise in prices of goods and services, which is confusing the cause with the effect of inflation.